If your kitchen is having the same old countertop from years, then this might be the right time to get yourself a new granite kitchen countertop. You have many choices in the market when it comes to the kitchen countertops Edmonton and the best stone to go for is no doubt, granite. Many people have bad experiences in the countertops that include scratches, dents, stains, molds and mildew problems. If you are looking for a replacements that gives you protection from all this, then you cannot get a better option than granite. Granite countertops are the winners when you are going to compare them with every other stone choice in the market today. They are durable and versatile and they fit seamlessly to the kitchen regardless of the shape, floor plan, style, layout or the overall decor you have in the house. They are popular because they give you the best of style and function and after investing in a good granite stone, you can be sure of decades of service. In this article, we are going to list out some of the major benefits of granite counters. No other stone provides you as many colour choices that the granite has on offer. They are available in all the colours of the rainbow and they can fit with any colour choice that you have in your kitchen. Granite is available in several pattern choices as marbleized, solid colours, and sparkle look that gives it a unique style and combination that makes your kitchen look awesome. 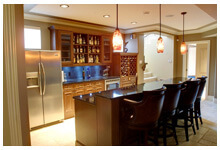 You can have the granite finished in either glossy or honed, depending on your decor. Honed finish gives it a more natural look at the surface. Granite is very eco friendly and you just can’t get a stone more environment friendly than granite. When you get the granite sealed, you also get safe from bacteria. As the surface becomes non porous there is no possibility for the moisture formation and it resists mold, mildew, and bacteria. Granite is the strongest stone choice that you have for the kitchen and once you get it installed, you can be sure of getting decades of service from it. The surface of the granite is resistant to scratches, dents, and chips in normal day to day usage. You don’t have to worry if you are going to put a hot dish directly on the surface as the granite is resistant to cracking. After all, it held up against hot lava! As no two granites are same, you are sure that the stone you have, is like no other you will ever find in another kitchen. Granite is very easy to clean on day to day basis and you just have to use water and a soft cloth to wipe it off after every use to keep it shining like new.